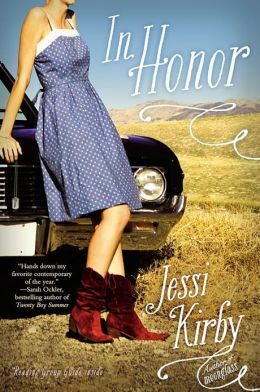 In Honor by Jessi Kirby is more than just a story about grief. It’s a story about how to find and except yourself after you lose a love one, and how to being rebuilding your life. Honor’s brother, Finn (a marine), was killed in action in Afghanistan. Aside from the aunt that raised them from children, he was the only family she had left. Ever since their parents died, Finn was always there to protect honor and with him gone, she can’t seem to make since of her life without him there to guide her. After they find out Finn has been killed, the last letter he wrote to Honor arrives in the mail. When she opens it, she discovers concert tickets for the last show their favorite singer will ever perform. Trying to find a way to honor her brother, Honor decides to take his ancient “classic” Impala on a road trip from their hometown in Texas out to California, with an unexpected travel companion for company. Traveling several miles through the desert in an old car, Honor and her brother’s best friend argue, sit through mounting awkward silence, and even exchange unforeseen sexual glances. Not only does Honor have to figure out how to navigate this world without Finn, but she has to find a way to forgive herself and others for not being exactly who she thought they were. Sometimes learning that the world isn’t strictly black and white can be a tough pill to swallow. I give this coming-of-age novel three out of five stars.